Knopf Books for Young Readers, 9780375840203, 40pp. Agatha Walker does not want to live on the busiest street in town!Rushmore Boulevard is the busiest street in town—until Agatha May Walker decides to do something about it. Armed with a batch of Sweet and Spicy ginger snaps, a wingback chair, a card table, and a Parcheesi set, Agatha and her best friend, Eulalie Scruggs, take to the street to reclaim it from the noisy cars, motorcycles, and giant trucks that rumble by all day long. Can these lifelong friends convince their neighbors to stop and smell the honeysuckle, listen to the mariachi band, and best of all, sample the Sweet and Spicy ginger snaps?In this charming picture book about slowing down, a laid-back attitude is the best kind. So sit for a spell and give it a whirl! Mara Rockliff lives in eastern Pennsylvania with her family. 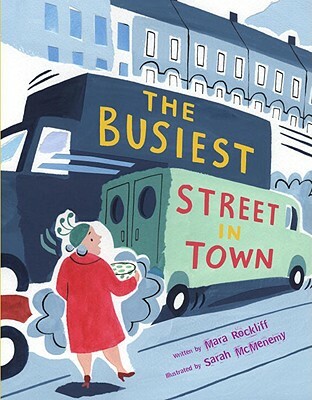 "The Busiest Street in Town" is her first book for Knopf.Sarah McMenemy is the illustrator of "The First Rules of Little Brothers," "Everybody Bonjours!, "and"Waggle." She lives in London, England.